This tour includes a variety of samples, which include but are not limited to: Pizza, soup, and a variety baked goods from different locations. You’ll finish our 2-hour walking tour feeling like a local – with an insider view into the local life, a satisfied stomach, and the confidence to continue exploring this classic working class, historical and hipster neighborhood. • Make sure you bring comfortable shoes as we will be walking for 2 hours and approximately 2 miles. • Wear appropriate clothing as this tour will take place rain or shine. Sunscreen and hat recommended for sunny days. Poncho and/or umbrella recommended for rainy days. If driving, where can I park? There is typically sufficient public parking on Frankford Ave in front of Pizza Brain. Additional free public parking can be found on E York St. Just make sure there is no "Permit 25" sign posted. • Pizza Brain: World's first pizza museum, known for their award-winning pies. The uniqueness of this place makes it stand out from any other pizzeria you've never experienced before. • Riverwards Produce Market: Neighborhood market that offers high quality produce by working directly with farms in Pennsylvania and New Jersey. • Philly Style Bagels: Local bagel place that started with a series of pop-ups at Pizzeria Beddia, it soon became famous for their acclaimed Classic Lox Sandwich. Their bagels are fermented in small batches, hand-rolled and boiled in a mixture of water and Yards IPA. • Cheu Noodle: Inspired by Japanse and Asian cuisines, with their great selection of beer and drinks, with a big oak banquet made to evoke chopsticks, and big octopus called Herbert looking at us, this is the perfect hipster spot to come enjoy with friends or on a date. • Good Spoon: Soups, stews and sandwiches made from scratch with fresh, local ingredients. Good Spoon focuses on seasonal products producing small batches of soup without any of the preservatives, artificial flavorings or sodium that you'll typically find in most canned/pre-made soups (Note: we won't be stoppping here if you're joining us on our Sunday tour as they're closed on Sundays during the summer). • Kensington Quarters: Known for being our local modern Farmer's Market. 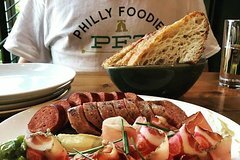 It is also a farm-to-table restaurant, whole animal butcher shop, bar and a learning space in Fishtown. They not only offer cooking classes, but also butchering classes and wine tasting classes. • Ramona Susan's Bakery Shop: Smallest bakery in Philadelphia! This bake shop is well known for their go-to home-style desserts.